My husband bought me a braiser for Christmas. By "bought me" I mean: I went to the store to check one out, fell in love with it, realized it was on sale, realized my favorite color was in stock, brought it home with me, wrapped it, and put it under the tree. Though I plan on using the pan as a deep 12" skillet most of the time, I used it for its intended purpose a little while ago preparing this dish. The recipe for it has been passed around my family for a few years and is a favorite because it is simple and easy. 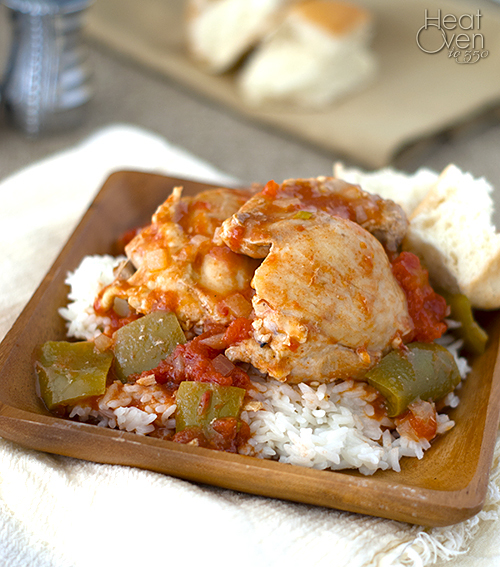 Chicken thighs are braised with tomatoes and bell peppers until they are tender and juicy, and the liquid from cooking the thighs is concentrated into a sauce. 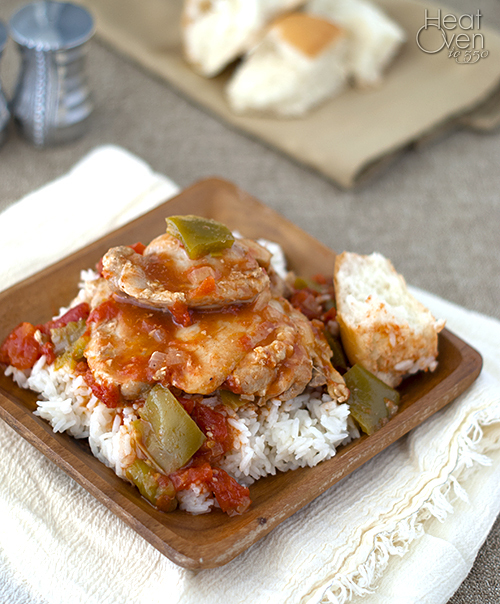 The thighs and sauce are served over rice for an easy dinner. It is plain enough to satisfy even picky eaters but still flavorful. It also has the potential for add-ins to make the recipe your own. I'm sharing the bare bones version here but feel free to add more herbs, mushrooms, olives or whatever you enjoy. If you didn't happen to buy yourself . . . er . . . receive a braiser for Christmas this year, don't worry. A deep skillet or large dutch oven will work as well. If you are fortunate enough to have a pressure cooker, check out my guest post at Pressure Cooking Today to see an adaptation of this recipe that cooks in half the time. Heat 2 tablespoons oil in heavy large skillet over medium-high heat. Sprinkle chicken with salt and pepper. Working in batches, cook chicken until golden brown, about 4 minutes total. Transfer to a plate. Add onion to same skillet; sauté until onion is soft, scraping up browned bits, about 4 minutes. Add garlic, oregano and red pepper flakes and cook until fragrant, about 1 minute. Add bay leaf, green peppers, tomatoes, and chicken broth; return chicken to skillet. Cover; simmer over medium-low heat 30 minutes. Uncover; cook until chicken is tender and sauce is reduced, about 15 minutes. Remove bay leaf. Season with salt and pepper to taste. Serve over rice or pasta. Thanks so much for guest posting on Pressure Cooking Today! Love that you also posted the non-pressure cooker version of this great weeknight meal. I've never heard of a braiser...but I love that you bought it yourself ;) Nate would never attempt to buy me a kitchen gadget, but his mom is actually a really good kitchen present giver- I've gotten a few Le Creuset items! This sounds like such a delicious quick meal :) Chicken thighs are pretty much the only kind of meat (but especially poultry) that I like to cook- it's virtually impossible to overcook them and they're always so moist! what an easy and healthy weeknight meal. Thanks!